To Select Another Product - Click Here! Centrifugally assisted diaphragm to increase holding capacity with RPM. Solid hub design for light weight and quick shifts. The Centerforce® TRIAD XDS 8.75” triple disc clutch has been developed for vehicles requiring a holding capacity of 500 to 1200 ft/lbs of torque at the crank. The billet pressure plate features our patented centrifugal weight system (where applicable) for superior clamp load and our patented ball bearing actuated pressure plate (where applicable) providing light pedal effort. The disc pack is equipped with metallic friction material providing increased holding capacity and is available in either sprung or solid hub (possible gear noise) depending on the application. 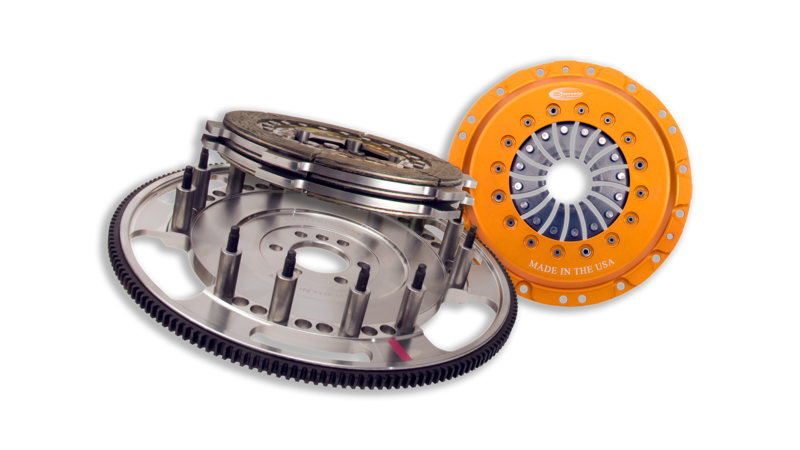 TRIAD XDS clutches are equipped with a lightened billet steel flywheel providing low inertia resulting in quicker RPM’s. Due to the aggressive nature of this race inspired clutch, vehicles may experience some floater noise and/or chatter during operation. Components are made in the USA, match balanced and ready for installation using the included ARP fasteners.